Bozorgi, M., Amin, G., Ostad, S., Samadi, N., Nazem, E., Shekarchi, M. (2017). Toxicological, chemical and antibacterial evaluation of squill vinegar, a useful product in Persian Traditional Medicine. 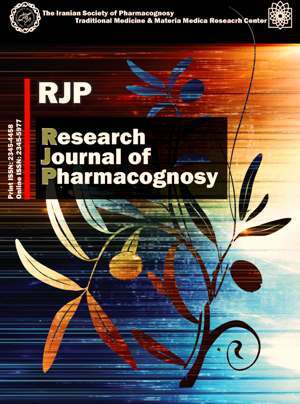 Research Journal of Pharmacognosy, 4(1), 33-39. M. Bozorgi; G.R. Amin; S.N. Ostad; N. Samadi; E. Nazem; M. Shekarchi. "Toxicological, chemical and antibacterial evaluation of squill vinegar, a useful product in Persian Traditional Medicine". Research Journal of Pharmacognosy, 4, 1, 2017, 33-39. Bozorgi, M., Amin, G., Ostad, S., Samadi, N., Nazem, E., Shekarchi, M. (2017). 'Toxicological, chemical and antibacterial evaluation of squill vinegar, a useful product in Persian Traditional Medicine', Research Journal of Pharmacognosy, 4(1), pp. 33-39. Bozorgi, M., Amin, G., Ostad, S., Samadi, N., Nazem, E., Shekarchi, M. Toxicological, chemical and antibacterial evaluation of squill vinegar, a useful product in Persian Traditional Medicine. Research Journal of Pharmacognosy, 2017; 4(1): 33-39. 2Department of Pharmacognosy, School of Pharmacy, Tehran University of Medical Sciences, Tehran, Iran. 3Department of Toxicology and Pharmacology, Pharmaceutical Sciences Research Center, School of Pharmacy, Tehran, Iran. 4Department of Drug and Food Control, School of Pharmacy and Phamaceutical Quality Assurance Research Center, Tehran University of Medical Sciences, Tehran, Iran. 5Department of Traditional Medicine, School of Traditional Medicine, Tehran University of Medical Sciences, Tehran, Iran. 6Food and Drug Laboratory Research Center and Food and Drug Control Laboratories, MOH and ME, Tehran, Iran. Background and objectives: Squill [Drimia maritima (L.) Stearn] is an important medicinal plant that has been used for medicinal purposes such as cardiovascular diseases and asthma since ancient times. Bufadienolides are the main compounds of this plant and are responsible for some reported adverse effects. In order to reduce adverse effects, different methods like boiling with vinegar were applied by traditional practitioners. In the present study, the acute oral toxicity, cytotoxic effects, proscillaridin A content and antibacterial properties of methanol and vinegar extracts of squill white variety were compared for exploring the efficacy of traditional processing method. Methods: Different doses of extracts (1000-5000 mg/kg) were administered during oral gavage in rats to analyze the acute oral toxicity. Cytotoxicity against HT-29, Caco-2 and NIH3T3 cell lines and antibacterial activity (Staphylococcus aureus, Staphylococcus epidermidis, Bacillus subtilis, Pseudomonas aeruginosa, Klebsiella pneumoniae and Escherichia coli) were investigated using MTT assay and conventional agar dilution method, respectively. Proscillaridin A content was evaluated in the extracts (vinager and methanol) by a validated high performance liquid chromatography method. Results: During the in vivo research no death or observed effect occurred in animals that received the extracts. Our results showed that all of the extracts exhibited no cytotoxic effects in experimented cell lines (IC50>1000 μg/mL). Proscillaridin A was only detected in the methanol extract and no significant antibacterial effect was detected in methanol extract. Conclusion: According to results of the present study, processing squill with vinegar according to traditional experiences can reduce possible the side effects of bufadienolids. Ghahreman A. Flora of Iran. Tehran: Research Institute of Forests and Rangelands,1997. Zargari A. Medicinal plants. 4th ed. Tehran: Tehran University of Medical Sciences Publication, 1996. Bozorgi M, Amin GH, Shekarchi M, Rahimi R. Medicinal plants of the genus Drimia: a review on traditional uses, phytochemistry, pharmacology and toxicology. J Tradit Chin Med. In press. Bozcuk H, Ozdogan M, Aykurt O, Topcuoglu F, Ozturk H, Ekinci D, Karadeniz A, Mutlu A, Burgusu D. Urginea maritima (L.) Baker (Liliaceae) extract induces more cytotoxicity than standard chemotherapeutics in the A-549 non-small cell lung cancer (NSCLC) cell line. Turk J Med Sci. 2011; 41(1): 101-108. El-Seedi HR, Burman R, Mansour A, Turki Z, Boulos L, Gullbo J, Goransson U. The traditional medical uses and cytotoxic activities of sixty-one Egyptian plants: discovery of an active cardiac glycoside from Urginea maritima. J Ethnopharmacol. 2013; 145(3): 746-757. Mammadov R, Makasci-Afacan A, Uysal-Demir D, Gork C. Determination of antioxidant activities of different Urginea maritima (L.) Baker plant extracts. Iran J Chem Chem Eng. 2010; 29(3): 47-53. Pascual-Villalobos MJ, Fernandez M. Insecticidal activity of ethanolic extracts of Urginea maritima (L.) Baker bulbs. Ind Crops Prod. 1999; 10(2): 115-120. Civelek HS, Weintraub PG. Effects of two plant extracts on larval leaf miner Liriomy zatrifolii (Diptera: Agromyzidae) in tomatoes. J Econ Entomol. 2004; 97(5): 1581-1586. Avicenna. The Canon of medicine. Sharafkandi A. Tehran: Soroush Press, 2008. Aghili MH. Makhzan-al-Advia. Rahimi R, Shams Ardakani MR, Farjadmand F. Tehran: Tehran University of Medical Sciences Publication, 2009. Zhao Z, Liang Z, Chan K, Lu G, Lee E, Chen H, Li L. A unique issue in the standardization of Chinese materia medica: Processing. Planta Med. 2010; 76(17): 1975-1986. OECD/OCDE. Guidelines for acute toxicity of chemicals. Paris. Organization for Economic Co-operation and Development, 2001. Khanavi M, Gheidarloo R, Sadati N, Shams Ardekani MR, Nabavi SMB, Tavajohi S, Ostad SN. Cytotoxicity of fucosterol containing fraction of marine algae against breast and colon carcinoma cell line. Pharmacogn Mag. 2012; 8(29): 60-64. Ecobichon DJ. The basis of toxicity testing. 2nd ed. Boca Raton: CRC Press, 1997. Tuncok Y, Kozan O, Cavdar C, Guven H, Fowler J. Urginea maritima (squill) toxicity. J Toxicol Clin Toxicol. 1995; 33(1): 83-86. Heber D. Physician´s desk refferences (PDR) for herbal medicine. 4th ed. Montvale: Thomson healthcare Inc, 2007. Mason AB, Pugh SE, Holt DW. Cardiac glycoside toxicity resulting from cough drug abuse. Hum Toxicol. 1987; 6(3): 251-252. Smith W, Gould BA, Marshall AJ. Wenckebach’s phenomenon induced by cough linctus. Br Med Journal. 1986; 292(6524): 868. Scott WJ, Beliles RP, Silverman HI. The comparative acute toxicity of two cardiac glycosides in adult and newborn rats. Toxicol Appl Pharmacol. 1971; 20(4): 599-601. Li ZY, Sun HM, Xing J, Qin XM, Du GH. Chemical and biological comparison of raw and vinegar-baked Radix Bupleuri. J Ethnopharmacol. 2015; 165: 20-28. Wu H, Waldbauer K, Tang L, Xie L, McKinnon R, Zehl M, Yang H, Xu H, Kopp B. Influence of vinegar and wine processing on the alkaloid content and composition of the Traditional Chinese Medicine Corydalis Rhizoma (Yanhusuo). Molecules. 2014; 19(8): 11487-11504.